1. There are at least 2.3 million children of prisoners. 2. 7.3 million children have a parent under some form of correctional supervision. 3. 22% of children with a parent in prison are under 5 years old; 58% of children are under 10; the average age is 8 years old. 4. One in five children is present at their mother's arrest. 5. Children of prisoners are six times more likely to go to prison than their peers; they are seven times more likely to be involved in the criminal justice system. 6. Children of prisoners are labeled the most AT RISK children in the nation. 7. In California, if the child isn't reading on a 4th grade level when tested, they will plan to budget building another jail cell. 8. 93% of imprisoned parents are male and predominately held in state prisons rather than federal facilities. 9. The number of minor children with an imprisoned father rose 58% from 1991 thru 1999 compared to a 98% increase during the same period in the number of minors with an imprisoned mother. 10. 40% of imprisoned fathers and 60% of the mothers reported weekly contact with their children by phone, mail, or visit. However, a majority of both fathers (57%) and mother (54%) repoirted never having had a personal visit with their children since their admission to state prison. 11. More than 60% of parents in state prisons reported being held more than 100 miles from their last place of residence. 12. About 14% reported a mental illness, and 70% did not have a high school diploma. 13. At the time of their most recent arrest, 27% of the fathers and 50% of the mothers in state prisons were unemployed. In the month prior to their arrest, 46% of the parents said they had income of at least $1000 a month, and 27% said their income derived from illegal activites. 14. Mothers in state prisons were twice as likely as fathers to say they had been homeless in the year before their arrest. Our target population is children, ages seven to fifteen, of incarcerated parents. There are over 70,000 of these victims in southern California and statistics show that these children are five times more likely to end up in prison (The Barna Research Group). The founding family chose to serve this population because of a child's cry to God in a Sunday School classroom for his daddy that was taken away to prison. Sunday School teacher Sophia Pirelli shared with her family how this little boy touched her heart! That day the Lord put a desire and passion in the hearts of the family to serve and minister to these vulnerable children and at that point, the family chose to dedicate the family ranch to these high-risk forgotten, hurting, and needy victims. As the family began to research what services, ministries, and programs were available for these children, they came across some staggering statistics, which you can see above. According to the justice system experts, they found these children were seven times more likely to become involved in the juvenile justice system than their peers. They suffer from depression, substance abuse, bursts of aggression, disruptive behavior, eating and sleeping disorders, diminished academic performance, and feelings of abandonment, loneliness, shame, guilt, and resentment. The family decided to respond by giving these children a Calicinto Ranch Camping Experience. With the help of our close friend and partnership; Chuck Colson was very instrumental and inspirational in us reaching children of prisoners. His excitement, support and love for reaching the hurting gave us a tremendous boost in what God was doing in and through Calicinto. Calicinto Ranch welcomes children from any and all cities in the 10 southern California counties. The majority of these children are coming from Los Angeles, Riverside, San Bernardino, San Diego, and Orange counties. Children with one or both parents in prison come from 69 cities, representing six counties. 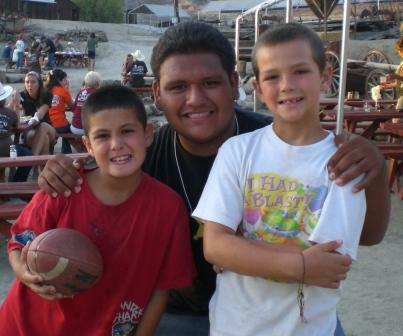 When these children come out to the ranch, we abundantly pour out to them love, food, and fun activities! The Western setting with horses, hayrides, campfires, archery, swimming, and farm animals takes them out of their city environment and allows them to relax, have fun, and experience encouragement, "Character First" instruction, and role model presentations.